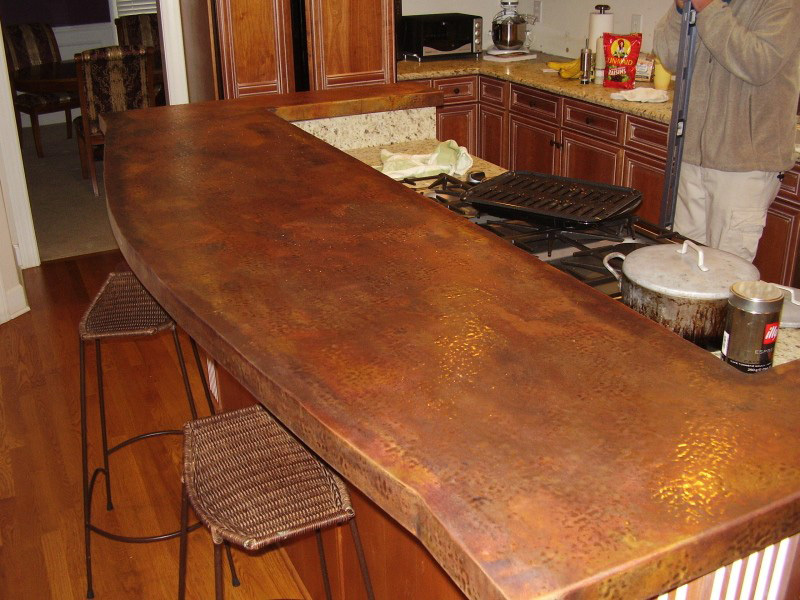 Circle City Copperworks will add a classic look to your bar or kitchen after installing our custom made copper bar top. Below, you can see from our portfolio, the different types of copper bar tops, each seen are custom made by the finest standards. More home owners realize that copper bar tops are both beautiful and functional. New home owners install custom copper bar tops to to add character to a room by installing a copper item. Copper bar tops add class to any gourmet kitchen when you select from our custom and pre-designed copper counters. Choose today to remodel your kitchen or bar with one of our copper bar tops! This is a rustic island Copper Countertop for a log cabin homeowner in Lake Tahoe. This countertop is over 10' in length so we had to weld 2 sheets of 48 oz Copper together and blend in the seam. It was finished in a light patina with a regular hammer. 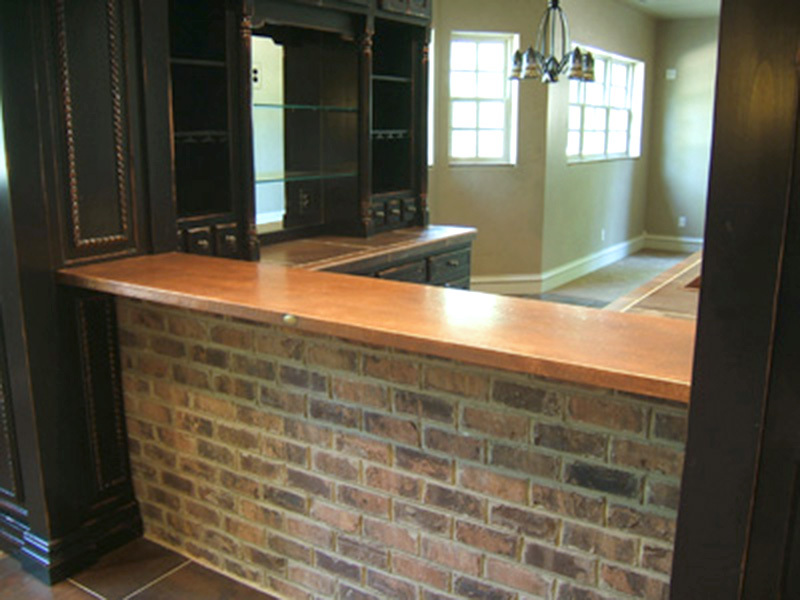 This bar top was installed in Zionsville, Indiana. The front edge turns straight, and then has a beautiful radius detail in the center. All Copper Countertops are manufactured using 48 oz. pure American copper. This picture is of a hammered countertop. It has a flamed patina with a medium brown over the top that our customer chose to help tone down the yellow that you get when you do a flamed patina. Copper Bar Top w/ Clavos added to edge. Here we created a Medieval hammered top with ornate clavos spaced around the top. It is pictured in a medium brown patina with pyramid shaped antique copper clavos. It is a simple design that the customer wanted for a bar in their basement. We have many designs and colors of clavos we can provide to dress up any of our products. Please call for pricing. No lead, tin, or arsenic content is contained, like you will find in unregulated foreign copper products. 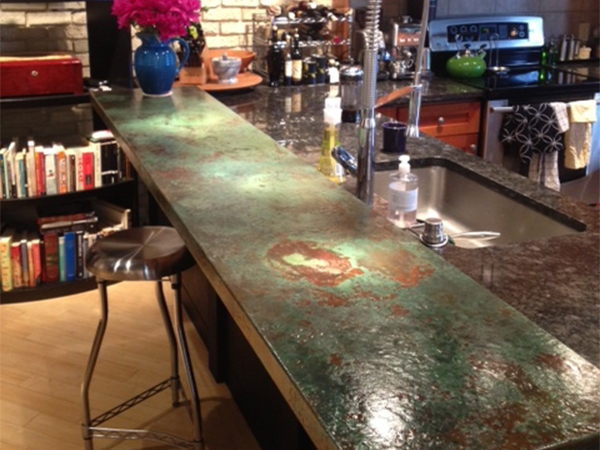 This is a copper bar top we created for a customer here in Indianapolis. It is medieval hammered copper with a light mottled patina. It is 18" wide, 8' long and is the standard 1 1/2" thick. It was made out of 48 oz. pure American copper. This bar top cost $1500.00. 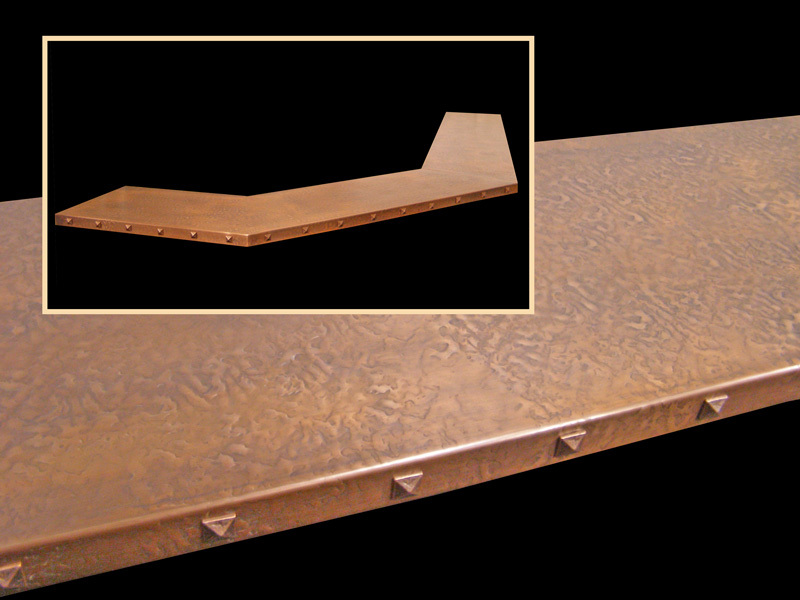 This smooth bar top is pictured in a light brown patina. This countertop required a template to match in order to make sure it was a tight fit between the wood columns. Just enough room was left for it to slide in without scratching the wood. This countertop is 18” wide and 9’ long. Please call, fax or email Circle City Copperworks to discuss the pricing and options available for our countertops. We made this to follow the exact shape that our customer desired. It is pictured in a light brown patina and is hammered. It is 2’ wide to the outside of the arches and is approximately an 8' x 2' inside L shape. This bar top cost $3630.00. This was shipped out of town, and we were told that it was easy to install like most of our countertops. We can ship anywhere in the country without any damage or hassle, and another customer was happy. The custom patinas will add and extra cost, but think of all of the color possibilities you can have. Plus, no one else will have anything like it. Copper as a bar top surface is for those owners who will accept that this surface will evolve with time. Your copper bar will age with use and establish a deeper, solid color over the surface. This change is part of the charm of a copper bar top. On most of our bar tops we recommend waxing. Upkeep will require applying a food grade wax to the surface of your copper bar. You only need to clean the bar top with hot water and dish soap or mild hand soap. No harsh chemicals needed. If you have other ideas in mind, sketch something up and send it to us, to see if this is a possible option for your bar top. Clavos add an additional option to finish off your countertop. 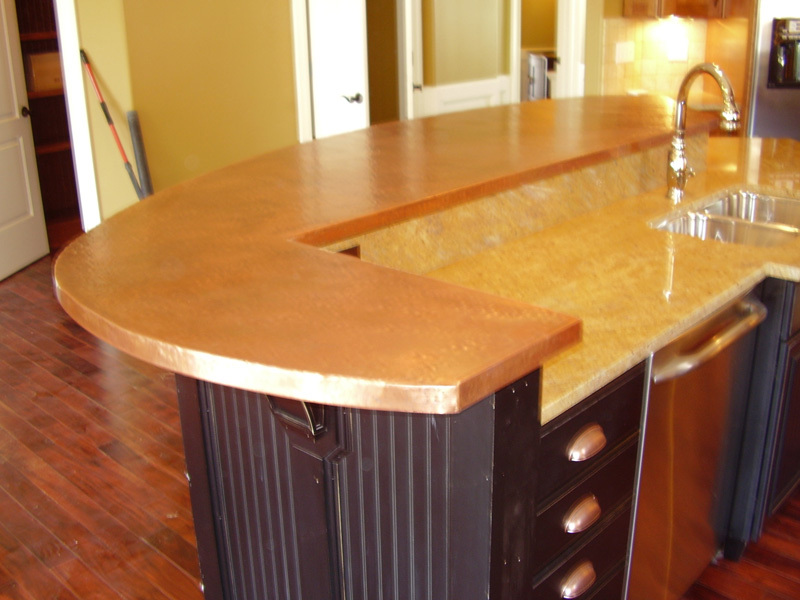 Circle City Copperworks fabricates copper bar tops as complete units. When you receive one of our bar tops, all you will need to do is fasten it to your cabinet or table, no further work is required. We build a wood substrate and wrap it with the copper down the sides and slightly underneath so that only copper is visible. We then weld, grind, and sand all edges and/or seams to make it one complete solid unit. We then mechanically attach the substrate to the copper from underneath. We do not use any types of glues or epoxies because none of them are recommended to adhere copper and will fail over time. Our bar tops are fully attached and solid for a life time, unlike others that glue or fasten their tops which will eventually bubble or pucker over time. We have found this out overtime for ourselves. All of our standard options as far as hammer and/or patina finishes are available, like all other copper products that we make.